Unitarian Universalism's hymnbook - hymns, songs and readings from around the world. "Pew Edition" 415 hymns and songs and 317 readings. Hardcover. 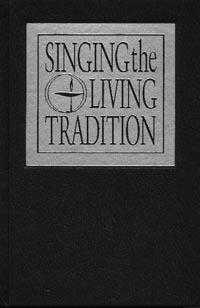 To order a copy of Singing the Living Tradition in Braille for $35.00 (including shipping), contact Linda M. Horton at LindaHorto@cs.com or write to her at 9322 E. Cedar Waxwing Drive, Sun Lakes, AZ 85248.